Well, I was going to tell you all that I'd baked these cupcakes because of the gorgeous warm weather we've been having, but as I sit typing this, it's pouring down with rain and freezing cold. Nevertheless, summer really is on it's way and I've felt a little bit of a shift in the types of things I wanted to bake. I want to make fun and colourful things with light flavours, but still pack a bit of a punch. 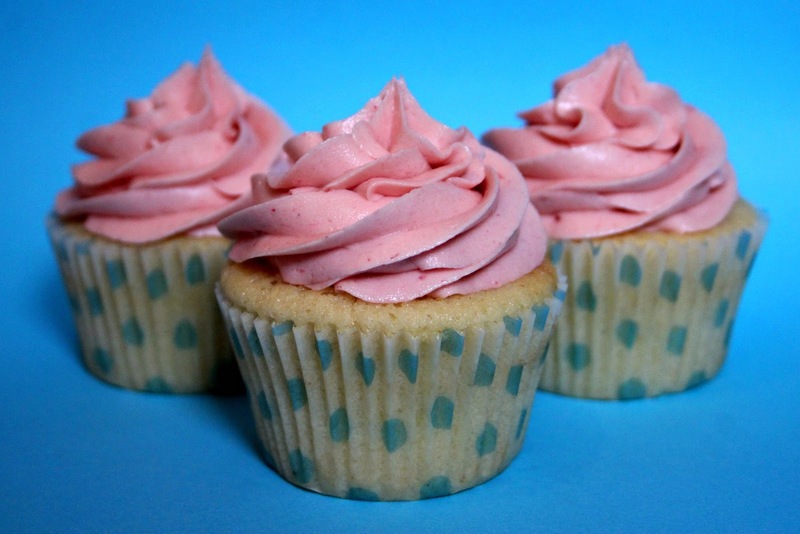 With that in mind, I came up with these scrumptious pink lemonade cupcakes! I realise that they may look a little plain (thinking back now, I wish I had some cocktail umbrellas to stick in them, but I kind of like the minimal look), but they really make up for that in their flavour. Pink lemonade is one of those things that I kind of forget exists, but then when I see it in shops, I'm just all over it. It's just like summer in a glass! You just can't fault the lemon and berry flavour of it, which is something that I channelled into these cupcakes. The cakes themselves are packed with lemon zest and juice to give them that zingy taste, while the buttercream contains real raspberries, giving it that signature pink colour and sweet flavour. With these two flavours combined, the taste is so dreamy. It really is just like taking a bite out of summer. Now, I don't want to blow my own trumpet too much, but these are some of the best lemon cupcakes I've ever made. When removing them from the cupcake tin, I could feel that the sides were quite soft and squishy, so I though 'uh oh, when I peel the case off, the cake's just gonna fall apart.' I was totally wrong! When I had my tester cupcake - can't share the recipe if the cake's are naff - I was so surprised when the case came off in one clean motion. The cake held it's shape beautifully, but the sponge was still so soft and airy. This is going to be my staple lemon cupcake recipe from now on because of this! Gradually add your dry ingredients to the wet ingredients, and beat gently after each addition until the mixture becomes thick. Add in the milk, lemon zest and juice, and mix until just combined. Overmixing is not your friend! Whizz your raspberries in a blender, food processor or use a hand blender until they turn into a smooth coulis. Pour this mixture into a sieve over a bowl, and strain the mixture through. If you like, you can add a couple of tablespoons of milk to the blended raspberries beforehand to help the mixture strain through easier. Once strained, set to one side. In a large bowl, beat the remaining 200g of unsalted butter to soften it further, then add in your icing sugar 100g at a time, beating after each addition. 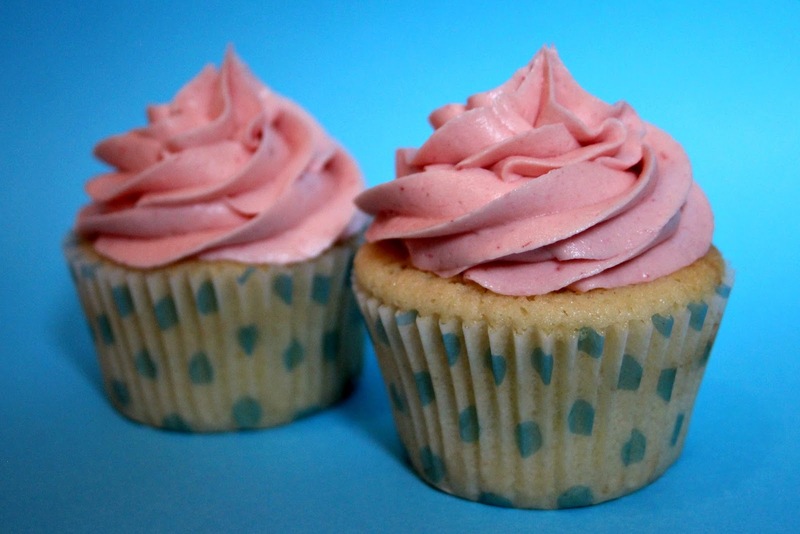 When you reached your desired buttercream consistency, add in your strained raspberry coulis and beat. The mixture should be smooth and a gorgeous shade of pink. Here, you can add more icing sugar to thicken the mixture or a splash of milk to loosen it. Pipe your buttercream on top using your favourite nozzle and decorate to your liking. Sprinkles, cocktail umbrellas or even striped straws would look fab! These little guys are ideal for summer parties or for taking on picnics. If you were feeling especially naughty, you could even add a touch of raspberry liqueur to the buttercream for a pink lemonade cocktail cupcake! But either way, these cupcakes are so fun and perfect for people that aren't big fans of chocolate. Does it matter that I'm nearing winter and I still want these> Never mind being perfect for summer, I'd seat this any time of the year! I'm coming close to trying out one of your recipes! I think I'm going to set out and buy ingredients and get baking this weekend! With an 11-month-old who is a little icky after nursery today I'm craving sugar! Stuff the raw ginger tonight, I want some of your cakes. They're beautiful. I've never been a cake-maker but I might try your recipe tomorrow..see how I get on! Thank you for this post!